Try drinking the recommended amount of eight to 10 glasses of water a day to keep you, and your face hydrated. When your body is not trying to hoard water, it allows the edema (puffiness) to disappear, and is better able to flush out toxins. Green tea is packed with antioxidants and is a natural detoxifier for your skin and body. 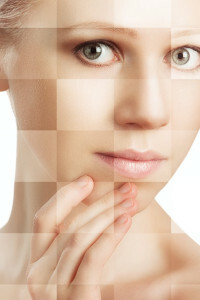 Sipping a warm cup in the morning and the afternoon can do wonders for your skin. You can also use green tea as a topical remedy by steeping the bags in boiling water, allowing them to cool for a few minutes in the refrigerator (or freezer) and applying them to areas of puffiness such as the cheeks and eye area for about 20 minutes. Sometimes your face could use a helping hand to get the blood flow going and relieve the puffiness. Using a moisturizer or light oil, lightly massage your face with your fingertips in a gently circular motion. Start at your forehead and slowly work your way down under your eyes, then to your cheeks, jaw and neck. Repeat several times. Other methods can include using a cool face mask or a washcloth dipped in cold water and wrapped around an ice cube to compress your face and eye area, or laying cool cucumber slices on your eyes. Before the stress of the holidays starts to wear on you, schedule your next appointment with us! Book easily online, or give us a call at 703.496.2066.